Grape seed oil is rich in proanthocyanidins, powerful antioxidants, which are 20 times stronger than vitamin C and 50 times more effective than vitamin E, and precisely these free radicals protect the skin from again. This valuable product is rich in fatty acids, especially linoleic essential, which prevents the loss of moisture and regulates the production of oil. Thanks to the many medicinal properties, grape juice and grape seed oil are a part of many cosmetic products. Below we will try to give you more useful recipes that you can make at home. How do you get oil from grape seeds? The oil from grape seeds is obtained mainly from wine grape seeds, which are separated in the process of making wine. To many winemakers this has become a very lucrative business, though initially it was designed as a casual job. Today the extract and the oil of grape seeds are sold very well. In Europe this business has flourished at the beginning of the twentieth century and has held on until today. What we as consumers and buyers of this product should pay attention on as always is what is written on the back. Of course this is true not only for this product, but for all you just need to create the habit. The grape seed oil can have two purposes, namely: used in cooking and in cosmetics. If you need the oil for food it will be written on it, the same goes for cosmetic products. Why this note? For example. Oil from the seeds of grapes - may in themselves contain chemicals that should not be allowed to be consumed, moreover it can cause not so harmless health problems and numerous side effects. In the kitchen, this oil can be used in many different ways. Many people use the oil for frying food and with various types of meat, it is also added to the famous sauces, and even for making mayonnaise. As its taste is pretty neutral, grape seeds oil allows the main meals to express their full flavour and potential. It is a great combination with truffles, pepper and as a spice with other plants. The use of this medicinal oil in cosmetics is widespread and has become a part of many cosmetic products such as body care products, moisturizers, sunscreens, etc. Since it contains many antiseptic properties and helps skin regeneration it is especially popular for the face. It is also used as a massage oils when combined with other medicinal oils. Why this is so and what are the advantages of this oil to our health? It is a remarkable source of vitamin E and fatty acids. It is a great antioxidant because it has flavonoids and polyphenols. "Oligomeric procyanidin" flavonoids contained in grape seed oil are almost 50 times more powerful antioxidants than vitamin E.
An excellent choice for the cardiovascular system and heart health, since it reduces the levels of bad LDL cholesterol, and increases the HDL (good) cholesterol, and thereby reduces the risk of coronary disease. Linoleic acid which is contained in grape seeds is very useful for those suffering from diabetes. Strengthens the capillaries and repairs damaged blood vessels, prevents complications and improves blood circulation. Oil of grape seeds has an anti-inflammatory effect, eases pain in swollen joints caused by rheumatoid arthritis and gives them much more flexibility. Grape seed extract may prevent the development of cancerous cells thanks to numerous antioxidants. It helps in diseases such as bronchial asthma, dermatitis and allergy, because it suppresses sudden production of histamine. It is rich in the Omega 6, Omega 3 and Omega 9 fatty acids, which affects the aging process and prevent heart disease. The oil from the seeds of grapes for the face is especially effective as a mild moisturizer. Recovers skin after sunburn, reduces swelling and tightens the skin of the face. It is rich in minerals and vitamins, and also does not cause any skin irritation. Wash ten grapes, mash them with a fork and strain through cheesecloth into a separate container, and pulp with gauze rub onto the skin with circular movements. After a five-minute of body scrub, rinse your face with lukewarm water and apply a mask which is prepared as follows: freshly squeezed juice apply on the face and neck, repeat the procedure after 15 minutes and leave for 15 minutes. Face and neck, rinse with lukewarm water. The effects of this treatment are immediately visible because the skin becomes fresh and velvety. Wash 100 g of white grapes, berries and then peel them and blend them in a blender. Add juice of half a lemon and a teaspoon of oil from wheat. Soak the swabs in tonic, apply on face, and leave on for 10 minutes and then rinse. This vitamin tonic cleanses the skin, shrinks pores and provides the skin with freshness. To keep skin soft and pure, it is necessary to regularly conduct skin peeling that removes dead skin cells and provides better blood flow of the tissue. Squash five to seven grapes, mixed with a tablespoon of bran, and when you get a thick mass apply it in a circular motion on wet face and rinse with lukewarm water. Mash several grapes well, leave for two hours and strain. In a decilitre of juice stir two tablespoons of honey, half a teaspoon of salt and strain it again, add a glass of vodka, mix well and pour into a glass bottle. Slowly apply it on the previously cleaned face. Leave on for an hour and wash it off with lukewarm water. This lotion can be stored for one month in the fridge. It is a substitute for grape seed oil. Clean a peach, squeeze the juice, add a teaspoon of oil per grape seed and spirulina powder, and mix until you get a paste. Apply on the face and hold for 20 minutes. Later, rinse with warm water. This mask regulates the secretion of fat in the skin, resulting in impeccable complexion. Peel and mash a quarter of the tomatoes, pour 3 tablespoons of yogurt and oatmeal, and one tablespoon of mashed cucumber and grape seed oil. Mix well and add 2 chopped mint leaves and mix. Apply on the face, leave on for 10 minutes and rinse with warm water. Read more about natural face mask. Grate a little cabbage, mix with 0.5 dl of milk and put on a hotplate to cook until it becomes a thick paste. Allow it to cool, add the egg and a tablespoon of grape seed oil and mix until you get a smooth mass. Apply on the face and leave for 20 minutes. Wash it with warm water and apply the face cream. Whisk the egg, add three tablespoons of fresh milk, juice of half a lemon and juice of a dozen mashed seeds of white grapes. Mix the mixture, apply on the face, and leave it for half an hour and rinse with lukewarm water. Put a mask once a week, the result will become visible in a month. We recommend the text on natural anti-wrinkle cream. Make a mix of 1/4 of a cup of apple juice, grape and lemon juice and 1/4 of a cup of cane sugar, and stir until the sugar is dissolved. Clean the face well, using swabs and apply it on the face. Lie down, let the juice work for 15 minutes, then rinse with warm water and rub your face moisturizer. Apply the emulsion once a week and the results will become visible within 6 to 8 weeks. This is also a good substitute for grape seed oil. Mix 15 ml of hazelnut oil and 5 ml of grape seed oil (jojoba grape). Slowly add 6 drops of essential oil of myrtle, and 4 drops of lavender oil. Mix well, pour into a dark glass bottle and use instead of day and night cream. In 10 ml of oil from avocado pour 5 ml of almond oil, and then the same amount grape seed oil. Slowly add 6 drops of oil per rosemary, myrtle and palmarosa and mix well, pour into a dark bottle and use instead of night and day cream. Grape seed oil in this combination achieves excellent results. Mash five to seven grains of white grapes and mix with a spoon cereal. Apply the mass on the face, leave on for 15 minutes and rinse with lukewarm water. If the oil of grape seeds is applied for a short period of time, it very rarely causes any side effects. Still cosmeticians do not recommend that grape seed oil is applied for more than 12 weeks, in order to reduce the possibility of side effects and other risks. Some of the side effects that can appear are a mild hypertension, dizziness, fatigue and headache, sometimes accompanied by nausea. If you notice that your scalp becomes dry and itchy or you have some of these symptoms then call your doctor. 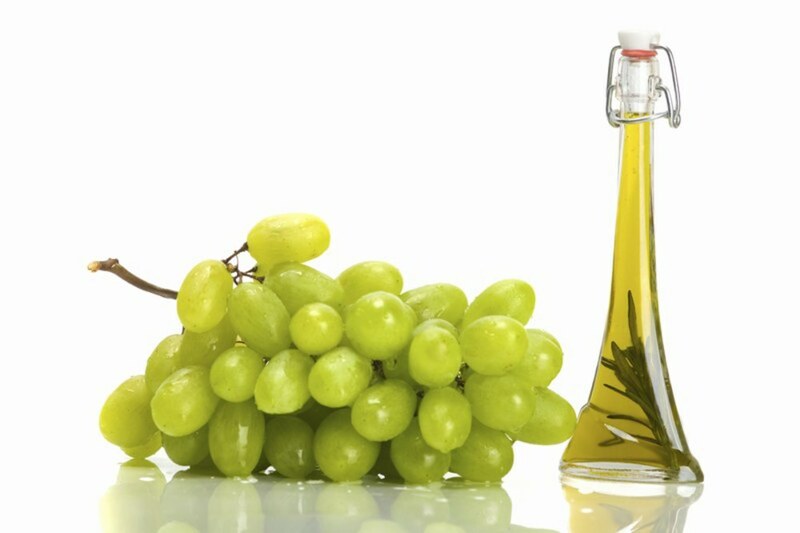 It goes without saying that these products should not be taken by people who are allergic to grapes, as well as those who drink different medications to bring down cholesterol or blood pressure, be sure to consult with an expert before applying any extracts which certainly includes the grape seed oil. We hope that you find the text was helpful and that you will try some of the recipes and prepare them. Grapes are definitely a great ally of beauty: the juicy berries are powerful antioxidants, full of minerals and vitamins, which renew and rejuvenate the skin. Thanks to its medicinal substances, this fruit protects the skin from adverse effects of UV radiation, prevents disease.